Fossil Group uses greenspace to set its corporate campus apart, but these days the CEO has a little less green in the company's stock. Workplace design has never been so important. If you need proof, look at retention, recruitment, and productivity at companies that did their offices right. Getting off the elevator on the ninth floor of Legacy Tower in Plano feels like stepping into a portal. Your eyes acclimate in a flash to the bright LEDs that shine up from the floor, out from the walls, down from the ceiling. The brand name “Hilti,” embedded in block lettering in the ground, is lit up under your feet. It feels like a corporate reimagining of being in the beyond from “2001: A Space Odyssey,” the scene in which a red-suited astronaut wanders about a Victorian bedroom that has been illuminated by a floor of stark-white LED lights. The tool manufacturer Hilti Group (based in Liechtenstein, a 14-hour flight across the Atlantic Ocean) moved its North American headquarters from Tulsa to Plano in 2015, in part to attract a millennial workforce. 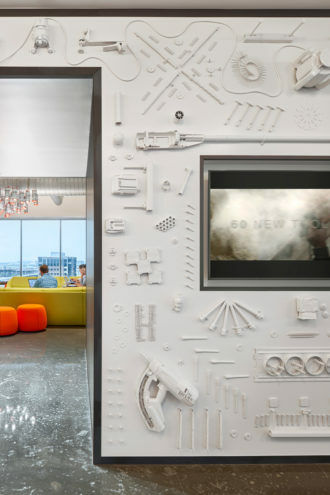 In doing so, it hired the global design firm Gensler to completely reimagine its space. All three floors prominently feature the company’s materials, more than 26,000 pieces of it: graphite-colored steel desks, light fixtures morphed from cylindrical firestop speed sleeves, 27.5-inch rods made of drill bits welded onto the stairs, 444 14-inch circular red diamond blades that jut out of the company’s logo on an upstairs wall (off the wall, they’re used to cut concrete). It’s a mix of open space and private alcoves. The offices for directors no longer hog the sun and sky on the exterior of the floorplan near the windows; those are on the inside now, allowing the natural light to flood in from the floor-to-ceiling glass. Manufacturing company Hilti embedded its own tools in a wall at its North American headquarters in Plano, turning its business into an art piece. The colors on two of the three floors are a slick mix of neutral greys and browns and blacks with accents of Hilti’s trademark red. But that ninth floor is different. This is where the software and development segment works. Those lights, that elevator lobby, the overall strategy of separating it from the others—these were all methods to convey a different style for the people who work on that floor, signaling that you’re entering a more creative, free-thinking space, where the employees are welcome to show up for work at 4 p.m. and call it a day at midnight. Here, you’ll find more vibrant colors—yellows and blues and greens—as well as a workplace environment that can be shaped depending on the project. Conference rooms made of modular glass walls can be resized as software is finished and teams are assigned new projects. Consider the open floorplan. It’s been more than two decades since billionaire Michael Bloomberg sat among his employees at Bloomberg LP (and, later, at the New York City mayor’s office), and the idea of the “open office” has incurred the same sort of rise and fall as any other trend common enough to make it to Forbes and Fast Company. Google may have popularized the concept in the late part of the last decade, but it seems companies are walking it back, adding carve-outs like private huddle rooms and “hotel” stations, which are communal desks for employees who work remotely. Taken together, it appears that companies have added an asterisk to the idea of the open floorplan. There are plenty of opportunities in North Texas for interior design firms to make it right. According to a report assembled last year by the Dallas Regional Chamber, North Texas welcomed more than 90 corporate and manufacturing relocations between 2010 and 2015, from companies as large as Liberty Mutual (4,000 jobs) and as small as the biotech firm AREVA Med (10 jobs). Meanwhile, companies already here are relocating: 7-Eleven, Raytheon, American Airlines, and State Farm have all expanded within the region, and they all have different needs. Government defense contractor Raytheon, which had its space designed by HKS, moved into a new, nearly 500,000-square-foot office in a Richardson mixed-use development, right in the middle of the amenities young employees desire—apartments, shopping, restaurants, gyms, coffee shops. It’s a reflection of the population surge back into America’s urban centers, which readily offer those types of services to the people who live there. The Richards Group’s headquarters off U.S. 75 near Uptown gives staffers breathtaking views of North Texas from every angle through floor-to-ceiling windows. In the 1980s and early 1990s, real estate brokerage and design were handled in-house at many large companies, remembers David Meyer, an associate principal and senior vice president for workplace strategy at HKS. But as the economy splintered, these same companies began eliminating divisions that didn’t support their core business. They contracted those services as-needed. And, in response, the design firms became more analytical, more complex, more nuanced. Technology has helped expedite the planning and design, allowing architects to create the workspace digitally before a wall ever goes up. As a result, architects will tell you readily that what’s popular won’t always work, and what looks nice from a distance may not fit. Innovation comes after thoughtful analysis, a deep-dive into the company’s operations and aspirations, ideally even before a site is selected. Whatever the reason for the new office, the workspace must match the company. Has it just merged? Is it looking to downsize? Expand? Jo Staffelbach-Heinz, the president of Staffelbach Inc. in Uptown, likes to spend at least a week immersed in the client’s business, observing everything from the pace to the minutiae of waiting for an elevator. She digs into conference room availability and analyzes the amount of time employees spend out of office. Angela Ramer, a “design anthropologist” at HKS, performs site audits to discover what she calls “the lived experience of that space.” She speaks of analyzing badge data to figure out how long every worker spends in the office, because that can help inform both the permanence of assigned spaces and the amount of square footage each employee gets. Functional amenities, designers say, are becoming the demand: Craft coffee, dry-cleaning services, gym memberships, commissioned art. At midsized law firm Gardere’s new digs at the McKinney and Olive building, the views of the Uptown and downtown skyline are complemented by works of art commissioned by Dallas gallery owner Cris Worley. It is, in many ways, the antithesis of traditional law firms. There are private offices on each of the four floors, separated by practice groups. You wouldn’t know which are the partners—their offices are larger, but they’re not in the corner. Those don’t exist. Step into our… living room? 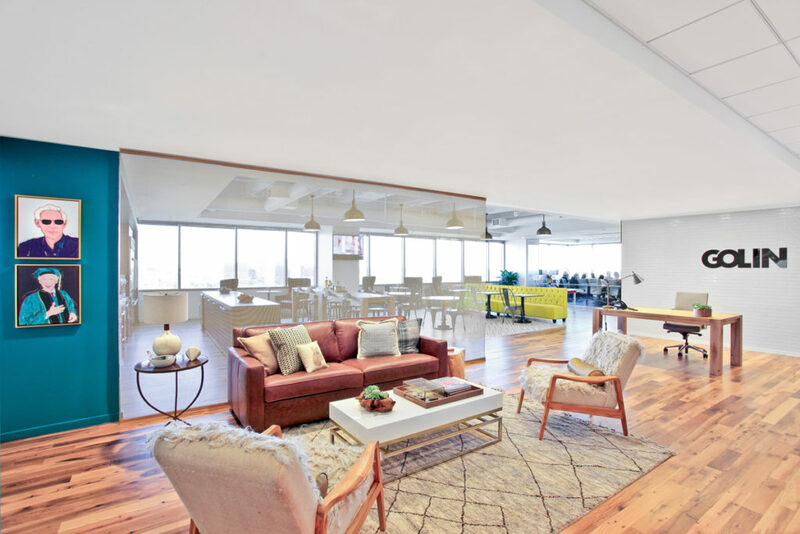 PR firm Golin goes to great lengths to make its employees and its clients feel at home. Just act like you’re not jealous of this furniture. The rest of the layout is transparent. 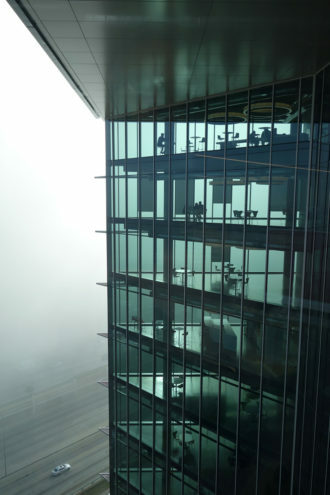 Dozens of conference rooms, most enough for no more than six to eight people, are encased in glass, the majority within eyeshot of the cranes and spec building happening all around them. It creates an air of activity, complemented by the gallery-quality art. It’s all linked by a wide, spiraling staircase, made of white oak and steel. And like most other modern workplaces, cords aren’t always necessary. Laptops travel freely from room to room and connect to Bluetooth conferencing services, allowing employees in the Dallas office to connect with their counterparts in Mexico City. There must be adequate room, too, for information technology systems. According to a survey of more than 1,000 IT executives by global telecom firm Tata Communications, 69 percent said cloud technology increased productivity. Sixty-five percent gave employees better access to data, and 63 percent said it cut costs. All this is done to provide an ease of comfort for the worker. From technology to layout to amenities, the workplace should make their actions more efficient. Staffers who work outside the office can continue to do so and have a desk for when they’re needed in-house. The collaborative open concept remains, but there are hideaways for private, head-down work. And, to cut down on hearing your neighbor, white noise is pumped in to drown out impertinent conversation. The coffee is fancier, the art is unique to the client, and the small touches that highlight the company itself are found in the architecture—subtle enhancements that highlight the brand without bludgeoning you with its name. Ideally, this creates a level of comfort that becomes an extension of the employee. Where you go to work starts to feel, almost subconsciously, like just another place in your day.